The aim of this study was to review the possible role of angiogenesis in the development and/or progression of various endocrinal disorders and its implications. Medline databases and articles available in PubMed, Medscape, and ScienceDirect were searched. The search was performed in 2013, and included all articles with no language restrictions. The initial search presented 150 articles. Among them, ten studies met inclusion criteria. These articles studied the role of angiogenesis in the development and/or progression of various endocrinal disorders and its implications. If the studies did not fulfill inclusion criteria, they were excluded. Study quality assessment included the following – whether ethics approval was gained, had specified eligibility criteria, included appropriate controls, provided adequate information, and defined assessment measures. There was heterogeneity in the collected data, and thus it was not possible to perform a meta-analysis. Significant data were collected, and a structured review was performed. The studies review and summarize the role of angiogenesis in the development and/or progression of various endocrinal disorders and its implications. We found that the angiogenesis plays an important role in the development and/or progression of various endocrinal disorders, where some endocrinal disorders were characterized or caused by excessive angiogenesis, whereas others were characterized or caused by insufficient angiogenesis. Angiogenesis in endocrinology is a new therapeutic target. Angiogenesis – the formation of new blood vessels from pre-exciting vasculature – plays a role in both physiological and pathological events, including wound healing, cancer, and diabetes . Angiogenesis is a multistep process that requires at least four independent events by endothelial cells, including detachment from basement membranes, proliferation, migration, and maturation ,,. Normally these events are regulated tightly by both proangiogenic and antiangiogenic factors; however, in pathological events such as diabetes, there is increased synthesis of proangiogenic factors with concomitant downregulation of antiangiogenic molecules. This leads to increased proliferation and migration of endothelial cells, resulting in the formation of immature and leaky vessels ,,,. Endocrine glands are typically vascular organs, and their blood supply is essential for normal function and tight control of hormone-feedback loops. In addition to metabolic factors such as hypoxia, the process of angiogenesis is also regulated by hormonal changes such as increased estrogen, insulin-like growth factor, and thyroid stimulating hormone levels . Angiogenesis has been shown to be related to tumor formation, prognosis, and response to treatment in many tumor types . Intratumoral microvessels can be related to tumor behavior or hormone secretion in different endocrine tumors ,. Several stimulating and inhibiting factors involved in the regulation of angiogenesis have been identified . Among them, vascular endothelial growth factor (VEGF) has been shown to be critically involved in angiogenesis and also in neovascularization of solid tumors. Dopamine agonists (already in clinical use for prolactinomas) have potent inhibitory actions on VEGF signaling , and thus may be a new tool in antiangiogenic therapy. Secretion of VEGF in the great majority of human pituitary adenomas is inhibited by dexamethasone. This suggests that glucocorticoids can be considered for the treatment of certain pituitary tumors. The cyclic nature of angiogenesis in the female reproductive tract indicates that stimulation or inhibition of paracrine angiogenic factors may lead to new approaches for being able to influence reproductive endocrine disorders. Experimental and clinical aspects of interactions between angiogenic factors and tumor growth of the endocrine system are also discussed . It has been demonstrated that delivery of angiogenesis factors and augmentation of angiogenesis response can be therapeutic to promote recovery. Conversely, in chronic disease such as atherosclerosis and chronic allograft vasculopathy, persistent angiogenesis promotes the ongoing recruitment of inflammatory cells, which in turn sustains the angiogenesis reaction. In this scenario, it has been proposed that antiangiogenesis therapy can attenuate disease and is therapeutic . We reviewed articles on the role of angiogenesis in the endocrinal system and in disorders from Medline databases including PubMed, Medscape, and ScienceDirect and also materials available on the internet. We used angiogenesis/antiangiogenesis/endocrinal system/endocrinal disorders, and hormones as the search terms. The search was performed in 2013, and included all articles that were published. There was no language restriction. Articles in languages other than English were translated. If the studies did not fulfill the above-mentioned criteria, they were excluded – for example, articles or reports not peer-reviewed. Data from each eligible study were independently abstracted in duplicate using a data collection form to capture information on study characteristics, interventions, and quantitative results reported for each outcome of interest. There was heterogeneity in the collected data, and thus we were not able to perform a meta-analysis. Significant data were collected, and a structured review was performed with the results tabulated. The quality of all the studies was assessed. Important factors included study design, attainment of ethics approval, evidence of a power calculation, specified eligibility criteria, appropriate controls, adequate information, and specified assessment measures. There was heterogeneity in the collected data, and thus we were not able to perform a meta-analysis. Significant data were collected. A total of 10 studies were selected. The studies were deemed eligible if they fulfilled inclusion criteria. There was a high degree of heterogeneity regarding the implications of angiogenesis in endocrinal disorders. Angiogenesis is the process of new blood vessel development from pre-existing vasculature. Although the vascular endothelium is usually quiescent in the adult, active angiogenesis has been shown to be an important process for new vessel formation, tumor growth, progression, and spread. The angiogenic phenotype depends on the balance of proangiogenic growth factors such as VEGF and inhibitors, as well as interactions with the extracellular matrix, allowing endothelial migration. In healthy individuals, angiogenesis is a feature of a limited number of physiological processes such as during ovulation, development of the corpus luteum, embryogenesis, lactation, during immune response, during inflammation, and wound repair. VEGF-A, a potent proangiogenic factor, is involved in the development of the kidneys and also plays an important role in maintaining the glomerular capillary structure. It is also involved in the repair process following injuries of glomerular endothelial cells and peritubular capillaries . Imbalance in angiogenic response either due to the overproduction of normal forms of angiogenic mediators [Table 1] or due to a relative deficiency in inhibitors results in a large number of pathological conditions such as heart and brain ischemia, hypertension, osteoporosis, respiratory diseases, and many other diseases [Table 2] . The endocrine system controls ductless glands that secrete hormones within specific organs. By acting systemically, hormones coordinate and integrate angiogenesis with other functions throughout the body. They also regulate blood vessel growth by controlling the production of local chemical mediators, often other hormones, but also growth factors, cytokines, enzymes, receptors, adhesion molecules, and metabolic factors, by vascular endothelial cells and other cells within the vicinity of capillaries. Notably, hormones can acquire angiogenic or antiangiogenic properties after undergoing proteolytic cleavage within the tissue microenvironment. Proteolytic cleavage is a mechanism used frequently to generate proangiogenic and antiangiogenic protein mediators at specific sites. Thyroid hormones – 3, 5, 3'-triiodo-l-thyronine (T3) and l-thyroxine (T4) – are important regulators of differentiation, growth, metabolism, and physiological function in most tissues ,. Thyroid hormones have also been implicated in cellular transformation, tumorigenesis, and metastasis, assuming particular importance in tumor-induced angiogenesis . In adults, angiogenesis occurs in the thyroid gland during disease processes including goiter, Graves' disease, thyroiditis, and cancer ,. Members of the growth hormone/prolactin/placental lactogen family ,, the renin–angiotensin system, and the kallikrein–kinin system regulate the physiology of reproductive organs, and some of their actions involve the control of blood vessel growth and regression. The angiogenic and antiangiogenic actions of members of the growth hormone/prolactin/placental lactogen family, the renin–angiotensin system, and the kallikrein–kinin system have been linked to both, reflecting the predominance of naturally occurring inhibitors able to counterbalance the effects of relatively abundant proangiogenic mediators. The study of this tight control of angiogenesis is particularly attractive in tissues such as the retina and cartilage, which are partially or totally devoid of blood vessels, respectively, and where damage to the mechanisms regulating angiogenesis contributes to the development of vasoproliferative retinopathies and arthritis. The induction of new blood vessel formation by delivering angiogenic genes to ischemic tissues continues to appear as a promising, alternative strategy to currently available therapies . In aspiring to induce therapeutic angiogenesis, the members of the VEGF family have long been recognized as major molecular tools . In diabetes, angiogenesis is disturbed, contributing to proliferative retinopathy, nephropathy, neuropathy, atherosclerosis, and impaired wound healing. In diabetic retinopathy, the balance between VEGF and angiogenic inhibitors may determine the proliferation of angiogenesis in diabetic retinopathy. As VEGF-A is a powerful angiogenic inducer, utilizing anti-VEGF treatments has proved to be a successful protocol in the treatment of proliferative diabetic retinopathy ,. The measurement of angiogenesis may facilitate therapeutic decision making, for example, determining tumors that are likely to behave aggressively, and therefore require close follow-up or subsequent radiotherapy. 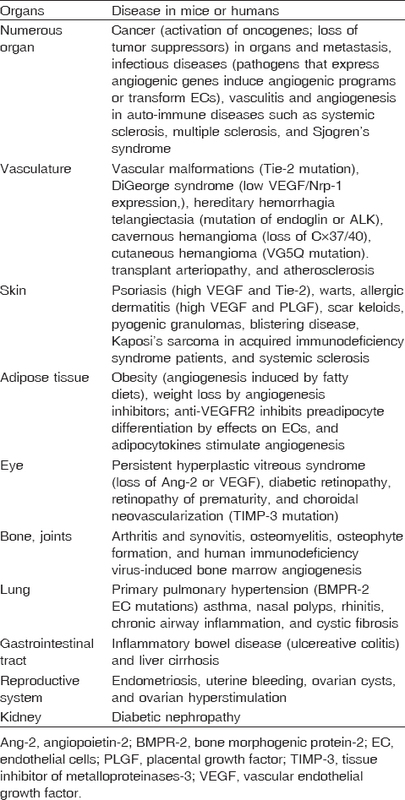 There are many angiogenesis inhibitors that have been investigated in clinical trials (mainly phase I/II), and an understanding of angiogenesis may enable the use of angiogenesis inhibitors as therapy for endocrine tumors, for example, synthetic matrix metalloproteinase inhibitors for aggressive tumors or tyrosine kinase inhibitors to inhibit VEGF signaling ,,,,,,. The use of angiogenesis inhibitors is not without risk. Sorafenib – an antiangiogenic agent – causes a unique combination of acute thrombotic microangiopathy and minimal change disease, resulting in renal failure and nephrotic syndrome . Angiogenesis is a normal physiological process that is tightly regulated by a dynamic balance between proangiogenic and antiangiogenic molecules. The definition of genetic steps determining different angiogenic phenotypes, and therefore tumor progression, might increase our understanding of neoplastic progression and also allow measurement of markers of aggressive tumor behavior, initiation of appropriate therapy, and monitoring of tumor behavior. Although antiangiogenic therapies have shown promising results from preclinical and clinical studies, many aspects of angiogenesis and antiangiogenic therapy remain to be further considered to overcome existing hurdles. Zent R, Pozzi A. Angiogenesis in diabetic nephropathy. Semin Nephrol 2007; 27:161–171. Pandya NM, Dhalla NS, Santani DD. Angiogenesis – A new target for future therapy. Vascul Pharmacol 2006; 44:265–274. Watson EC, Whitehead L, Adams RH, Dewson G, Coultas L. Endothelial cell survival during angiogenesis requires the pro-survival protein MCL1. Cell Death Differ 2016; 23:1371–1379. Gebala V, Collins R, Phng L-K, Gerhard H. Blood flow drives lumen formation by inverse membrane blebbing during angiogenesis in vivo. Nat Cell Biol 2016; 18:443–450. Bridoux A, Mousa SA, Samama MM. Pro- and anti-aniogenic agents (in French). J Mal Vasc 2012; 37:132–139. Bisht M, Dhasmana DC, Bist SS. Angiogenesis: future of pharmacological modulation. Indian J Pharmacol 2010; 42:2–8. Clapp C, Thebault S, Jeziorski CM, De La Escalera Martinez G. Peptide hormone regulation of angiogenesis. Physiol Rev 2009; 89:1177–1215. Turner EH, Harris LA, Meimed S, Wass AHJ. Angiogenesis in endocrine tumors. Endocr Rev 2008; 24:600–632. Cheng L, Huang Z, Zhou W. Glioblastoma stem cells generate vascular pericytes to support vessel function and tumor growth. Cell 2013; 153:139–152. Abiven G, Coste J, Groussin L. Clinical and brological features in the prognosis of the adreno cortical cancer: poor outcome of cortisal secreting tumours in a series of 202 consecutive patients. J Clin Endocrinal Metal 2006; 91:2650–2655. Poncet G, Villaume K, Walter T. Angiogenesis and tumor progression in neuroendocrine digestive tumors. J Surg Res 2009; 154:68–77. Bhang HS, Lee S, Shin J-Y. Efficacious and clinically relevant conditioned medium of human adipose-derived stem cells for therapeutic angiogenesis. Mol Ther 2014; 22: 862–872. Ghahremani MF, Goossens S, Nittner D. p53 promotes VEGF expression and angiogenesis in the absence of an intact p21-Rb pathway. Cell Death Differ 2013; 20:888–897. Góth IM, Hubina E, Raptis S, Nagy MG, Tóth EB. 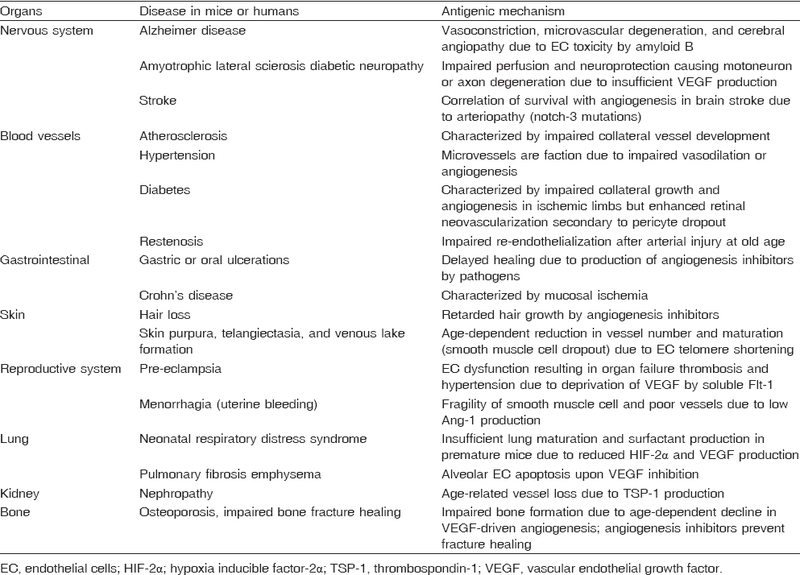 Physiological and pathological angiogenesis in the endocrine system. Microsc Res Tech 2003; 60:98–106. Denton MD, Magee C, Melter M, Dharnidharka VR, Sayegh MH, Briscoe DM. TNP-470, an angiogenesis inhibitor, attenuates the development of allograft vasculopathy. Transplantation 2004; 78:1218–1221. Folkman J. Tumor angiogenesis. In: Braunwald E, Fauci AS, Kasper DL, editors. Harrison's textbook of internal medicine. New York: McGraw Hill; 2000. pp. 132–152. Fischer C, Schneidre M, Carmeliet P. Principles and therapeutic implications of angiogenesis, vasculogenesis and arteriogenesis. Handb Exp Pharmacol 2006; 176/II: 157–212. Kang DH, Kanellis J, Hugo C. Role of the microvascular endothelium in progressive renal disease. J Am Soc Nephrol 2002; 13:806–816. Luidens MK, Mousa SA, Davis FB, Lin HY, Davis PJ. Thyroid hormone and angiogenesis. Vascul Pharmacol 2010; 52:142–147. Zhang L, Cooper-Kuhn CM, Nannmark U, Blomgren K, Kuhn HG. Stimulatory effects of thyroid hormone on brain angiogenesis in vivo and vitro. J Cerebral Blood Flow Metab 2010; 30:323–335. Ramsden JD. Angiogenesis in the thyroid gland. J Endocrinol 2000; 166:475–480. Tseleni-Balafouta S, Kavantzas N, Balafouta D, Patsouris E. Comparative study of angiogenesis in thyroid glands with Graves and Hashimoto's thyroiditis. Appl Immunohistochem Mol Morphol 2006; 14:323–332. Waters MJ, Barclay J. Does growth hormone drive breast and other cancers?. Endocrinology 2007; 148:4533–4535. Kusano K, Tsutsumi Y, Dean J. Long-term stable expression of human growth hormone by rAAV promotes myocardial protection post-myocardial infarction. J Mol Cell Cardiol 2007; 42:390–399. Gianni-Barrera R, Burger M, Wolff T, Heberer M, Schaefer DJ, Gürke L, Mujagic E, et al. Long-term safety and stability of angiogenesis induced by balanced single-vector co-expression of PDGF-BB and VEGF164 in skeletal muscle. Sci Rep 2016; 6:525–566. Giacca M, Zacchigna S. VEGF gene therapy: therapeutic angiogenesis in the clinic and beyond. Gene Ther 2012; 19:622–629. Crawford TN, Alfaro DV, Kerrison JB, Jablon EP. Diabetic retinopathy and angiogenesis. Curr Diabetes Rev 2009; 5:8–13. Simó R, Carrasco E, Garcia-Ramirez M, Hernandez C. Angiogenic and anti-angiogenic factors in proliferative diabetic retinopathy. Curr Diabetes Rev 2006; 2:71–98. Chen J, Zhou SJ, Zhang Y. Clinicopathological and prognostic significance of galectin-1 and vascular endothelial growth factor expression in gastric cancer. World J Gastroenterol 2013; 19:2073–2079. Rossiter H, Barresi C, Ghannadan M, Gruber F, Mildner M, Födinger D, Tscachler E Inactivation of VEGF in mammary gland epithelium severely compromises mammary gland development and function. FASEB J 2007; 21:3994–4004. Spratlin JL, Cohen RB, Eadens M. Phase I pharmacologic and biologic study of ramucirumab (IMC-1121B), a fully human immunoglobulin G1 monoclonal antibody targeting the vascular endothelial growth factor receptor-2. J Clin Oncol 2010; 28:780–787. Laschke MW, Menger MD. Anti-angiogenic treatment strategies for the therapy of endometriosis. Hum Reprod Update 2012; 18:682–702. Clarke JM, Hurwitz H. Targeted inhibition of VEGF receptor 2: an update on ramucirumab. Expert Opin Biol Ther 2013; 13:1187–1196. McCarthy T, O'Neil BH. Angiogenesis inhibitors in gastric cancer. J Orphan Drugs: Res Rev 2014; 4:55–61. Ferrara N, Adamis PA. Ten years of anti-vascular endothelial growth factor therapy. Nat Rev Drug Discov 2016; 15:385–403. Xu WW, Li B, Cheung AL. The potential of targeted anti-angiogenesis therapies in the treatment of esophageal cancer. J Gastrointest Cancer 2015; 5:79–88.